While some friends are living it up at #NYFW as we follow their every move on social media, it's hard to believe I'm 40 and making playdates with my three-month-old but here we are and I love it. Hayden has had a few dates lately. Earlier in the week, he had a date with Miss Molly Manno...and of course, had to dress up! 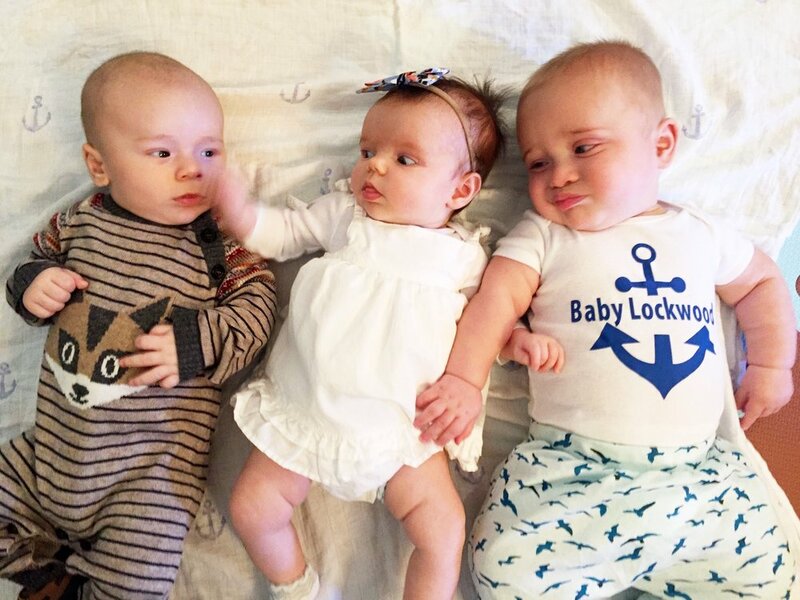 Then, we're losing it over here at these photos from our triple date today with Lennox and Molly! It's like Hayden had a chance with Molly, then Mr. Lennox came calling! And, it looks like Molly chose Lennox!! So funny. I can't get over how adorable these kiddos are together...I also can't get over how much our have changed in a phenomenally short amount of time. I mean, we were all just pregnant together! The three of us moms all had a busy day, but I'm so glad we still got together. Our dear friend Lacey had her baby, too, so we can't wait to bring Julia into the mix! It's good for me to see and hear how other first time mothers are handling their new lives with the baby. Having that village of other women is important. Hayden still isn't sleeping as much as I'd like at night, so Molly's mom (follow Ali Fedotowsky's blog here) shared some ideas. I'm laughing as I write this because no one sleeps as much as they would like to anymore. I can't believe I ever complained about a)sleep or b)my back hurting pre-baby. I had no idea what real sleep deprivation was! If you all have tips on babies sleeping longer stretches, let me know. I appreciate your comments. Meanwhile, Hayden is sleeping longer right now than he has maybe ever. And here I am not able to sleep! It's literally 2am and I cannot sleep. I'm learning lines for an audition and now writing here...Tomorrow may be rough. Our get togethers are much quicker than they used to be and involve a decent amount of chaos (check our snapchat: @ashleyaubra), but still just as much fun. ps- Check out Amy's blog here!